With Raspberry Coffee, life is anything but the same old "grind"! I don't know about you, but I absolutely LOVE COFFEE! ... It is by far my favourite drink. Coffee is often the first thing we have in the morning, it warms us on cold afternoons, and it is what we often serve with the evening dessert or baking that we are so proud of! Drinking Coffee has always been associated with relaxing and sociability. For some people, flavoured and specialty coffees are at the heart of life's simple indulgences, and people enjoy it with the sweetness of doing nothing. Cocooning with a mug of coffee and giving ourselves the permission to relax and socialize, or read, or whatever we desire to do during that time is one of the "perks" of loving coffee! 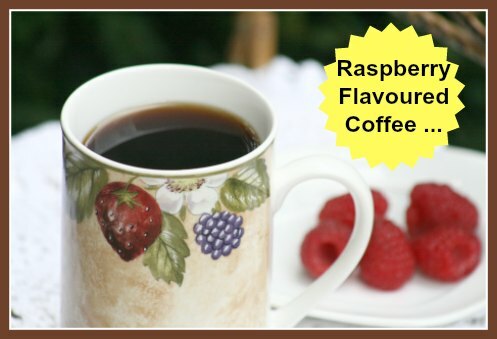 There are two ways to enjoy Raspberry Coffee - one is purchasing Raspberry flavoured coffee beans, (or ground coffee beans), and the second is to purchase pre-made raspberry flavoured syrup which is added to a regular brew. Check out Raspberry-Depot's Raspberry Iced Coffee Recipe ... a unique drink with a combination of coffee, cream, and fresh raspberries(!). It is best served over ice and garnished with fresh raspberries and whipped cream. I prefer the raspberry flavoured coffee beans, and even more so ... the chocolate raspberry ones! Every now and then, I treat myself (and my dear hubby) to chocolate raspberry flavoured coffee beans, which I grind just before making the coffee to ensure the best, freshest flavour. Coffee grinders are inexpensive tools that are easy to use, and, they really do make the freshest coffee possible! If you do not already own a coffee bean grinder, you may wish to purchase one for yourself ... they are great gift ideas too! "Coffee Time" in our home is the special time my husband and I stop our busyness and relax together; outside on our country patio in summer, and inside next to the fireplace in the winter. We savour or mug of coffee and chat about everything and anything ... as soul mates do ... when it comes to blessings ... surely ..."our cup is brimming!" Raspberry coffee ... and any regular or flavoured coffee is also a great gift idea for that special someone who seems to have everything ... and loves coffee! With the (usual) expense incurred when purchasing flavoured coffees, coffee-lovers often feel guilty about spending the "extra money" on special coffees. The best idea for these folks is coffee gift packages! Check out the links below, and you may find something to give that someone who is "just so hard to buy for". Or, you may find something here for yourself (like Raspberry Coffee!?! ), to spoil yourself with life's simple pleasures! Consider making a gourmet coffee gift basket - a wonderful gift to receive! There are many fantastic choices of mouthwatering coffee lovers gifts that you can add to your baskets. You can even choose to have a gift delivered right to the door of whomever you are planning to surprise! Click on the images (below) for more detailed product information and customer product reviews at *Amazon.com. If you are one who prefers ice caps, and cold coffee drinks, be sure to check out the recipe for homemade raspberry iced coffee.